Your child’s baby teeth help set the foundations for their permanent teeth. Legitimate question – for sure – but more and more dentists and parents are working together on the idea of preventive orthodontics, which can save a lot of time and money in the long run. Why the Need for Preventive Orthodontics? Preventive orthodontics provides dental professionals with a way to identify and intercept teeth problems in children, that when caught early enough, help to avoid more aggressive and costlier treatment later on. As your child grows, certain problems may become apparent during their regular examination at ConfiDental Health + Dental Clinic. These tooth problems may include, but are not limited to, crowding or too much space between teeth, overbite, underbite, extra teeth, missing teeth, jaw abnormalities, extracted teeth, and protruding teeth. What causes these types of problems? Genetics, poor nutrition, trauma, thumb/finger sucking, poor oral hygiene, and dental disease can all add to early onset of orthodontic problems. What Types of Preventive Measures are Used? The answer to this question differs depending on the situation. For example, early loss of a molar may require that we place a space maintainer in the space left by the tooth, to keep the space “reserved” for the permanent tooth. An appliance (headgear) that the child wears for 12-15 hours a day may be advised to correct top and bottom molar alignment. If your child is a thumb or finger sucker, there is an appliance that can be inserted in your child’s mouth that makes it difficult for your child to continue with a habit that can lead to a serious overbite problem. Permanent front teeth are the first to appear. If a problem exists, braces can be bonded to these teeth to correct the problem, potentially eliminating the need for more extensive, and expensive, orthodontic care. 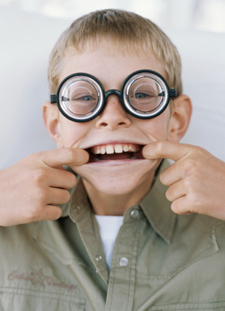 What are the Benefits of Early Orthodontic Intervention? Early intervention and treatment (as early as age 7) may prevent the development of far more serious conditions, making treatment options available that are less complicated , time-consuming, and expensive. When, after careful examination of your child, we determine that there are clear indicators that early orthodontic intervention is warranted, we will work with you to come up with a treatment plan to fit your child’s needs. What if I Suspect a Problem with My Child’s Teeth? If you do suspect a problem, waiting on it and hoping it will go away doesn’t work. Many times, too, you can be completely unaware that a problem exists simply because you can’t see it! Why not give us a call and let us examine your child. This will either put your mind at rest or initiate the necessary treatment to help your child’s smile become a beautiful adult smile.